Christin Anderson inspects resupinate fungi during a Palmer workshop. SNRE graduate student Christin Anderson has been tromping around Fairbanks woods, introducing first-graders to the wonders of the forest and of mushrooms. Anderson, who hopes to earn her master’s in natural resource management this semester, volunteered recently as a docent at Calypso Farm. She led 50 first-graders in rotating groups through the woods, garden, barn and a yurt with beehives. “I taught about the woods and got everyone very excited about mushrooms, which are my specialty,” she said. “We found a rotting log with soft, marshmallowy shelf-fungi (Plicatura nivea) fruiting from it, and when we broke it open, saw mycelium!” She took the students to a squirrel midden and explained the ecology of squirrels feeding on truffles, which are mycorrhizally connected to the spruce trees, which are homes for squirrels. “They might not have understood all the vocabulary I used, but we sure had a good time,” she said. Mycorrhiza is a symbiotic connection between the fungus and the roots of the plant. 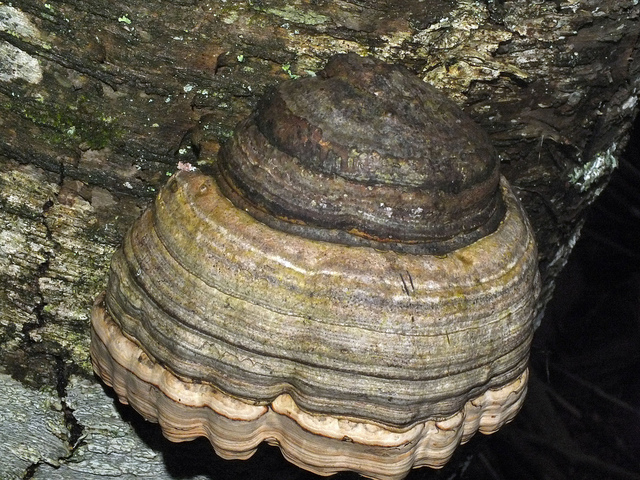 Tinder polypore was used by humans during the Ice Age. Anderson was also a guest speaker for the recent RAP retreat. She gave a 15-minute lecture on fungal biology and then walked with the group in the woods, where they found plenty of beautiful and interesting mushrooms. Another guest speaker taught the group about native plants and their uses, so they made a good team, she said. “My favorite part was when one of the students sawed open a tinder polypore (Fomes fomentarius) and lit a chunk of the fibrous interior on fire. It smoldered nicely, making it easy to imagine that same species being used as tinder by humans during the Ice Age.” The frozen, ancient “Ice Man” found in the Alps carried a pouch that contained that exact species, which could have been used to carry smoldering fire or for medicinal reasons, she said. 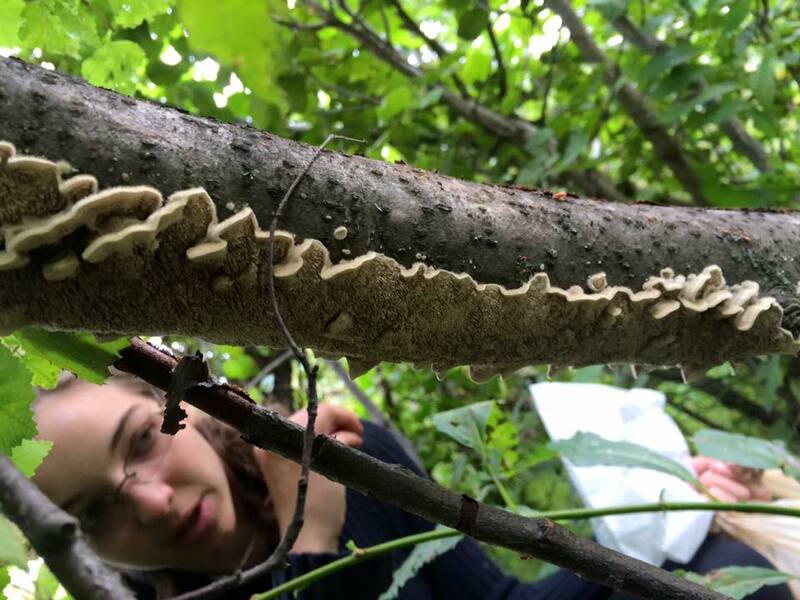 For her master’s project, Anderson is investigating the potential use of a white-rot fungi (Pleurotus ostreatus) for diesel degradation in subarctic soils, especially in cold temperatures. Mushrooms get their food from decaying wood or other organic matter, parasitizing living organisms or forming symbiotic relationships. She focused her research on the wood decay variety of mushrooms to see if they can degrade hydrocarbons, such as oil. She experimented with diesel-contaminated soil from Kaltag to see if the fungi would break down the contaminants. Soil remediation using fungi has been attempted successfully in warmer climates and is the subject of research interest. “It’s a whole new field of mycoremediation,” she said. She ordered the fungus online. She attempted soil remediation while growing it at different temperatures in several refrigerators in the Irving Building and in the West Ridge Research Building cold room. She is still analyzing her results. Anderson's interest in mushrooms began when she was a child and continued through college. She worked with mycologist Gary Laursen this summer and helped him teach mushroom identification workshops in Palmer, McCarthy, Homer, Fairbanks and Denali Park. She also taught a three-part class on mushroom biology, identification and cooking at the Folks School Fairbanks. She is also working with emeritus professor Glenn Juday as a research assistant on the Bonanza Creek research site. After she graduates, she plans to take some time off and then look for a job in the conservation area.